Team users rejoice! The upcoming Pagico 8.18 will bring a number of improvements to make teamwork and collaboration in Pagico a lot better. Pagico 8.17 (rev. 2382) brings a number of minor bug fixes and feature improvements, and it’s a free update for all v8 users. Today we are excited to let you know that our brand-new workspace data sync server, located in Paris, France, is now officially open for business! This marks our very first data sync server in the European Region, and we are absolutely thrilled to offer optimal data sync experience for our users in Europe. In order to select this new data sync server, you need to run the latest versions of Pagico. For more info about the software requirements as well as other details on our data servers, please check out this article. To celebrate our very first data sync server in France and to thank you for choosing Pagico, we are discounting *all* workspace renewals by 50%! Simply visit your Pagico ID portal, click on the “Renew” button for your workspace, and apply the coupon code below. Updated on March 15: This promotion has concluded. This promo code works on both Personal Sync and Team Sync workspaces, and it’s redeemable for workspaces on all server regions. As a limited time offer, this code expires on March 15. So don’t miss out! Want to win a full year of Personal Sync? Just share your #1 tip using Pagico on either Facebook or Twitter. Just be sure to mention #pagico in your post so we can find it! We will select ONE WINNER A DAY, until this giveaway ends on Feb 15. Update: This promotion has concluded. Thank you all for your participation! Pagico Mobile 5.3 has arrived on iOS! Greetings, everyone! 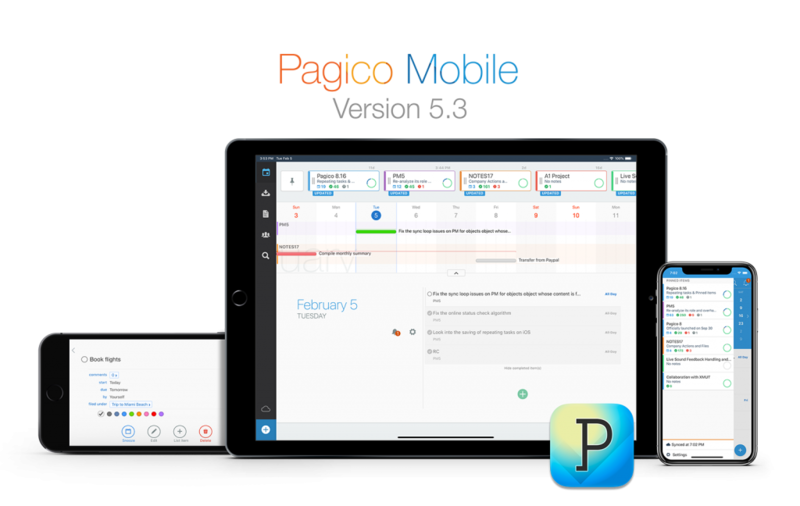 Today we are excited to announce the immediate availability of Pagico Mobile 5.3 for iOS. While this appears to be a point update, v5.3 packs quite a few key improvements that most users would enjoy. Today we are excited to let you know that our brand-new workspace data sync server, located in Paris, France, will officially launch on February 15th, 2019. This marks our very first data sync server in the European Region, and we are thrilled to offer optimal data sync experience for our users in Europe. In preparation for the launch of the new server region, we are also releasing updates to both our Pagico 8 for computer and Pagico Mobile for iOS and Android. Pagico 8.16 (r2375) is already available for download, while Pagico Mobile is being final tested and will be released within the coming days. Have questions about the new data sync server? Be sure to read our this article on the Online Documentation, or let us know via Twitter, Facebook, or email. Pagico 8.16 Update 3 (revision 2375) offers incremental improvements and is a recommended update for all v8 users.